Preheat the oven to 250°C/gas mark 9/500°F. Place the fat into a roasting tin (large) and then heat up in the oven for between 20–30 minutes until piping hot. Peel the potatoes, and roughly chop each one into 3 by cutting off both ends at a slant which will leave you with a wedge/triangle in the middle. 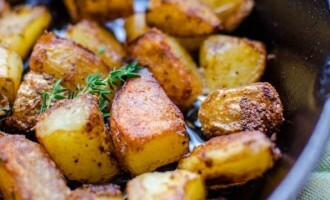 Place the potatoes in cold water with two tablespoons of salt in a saucepan. Bring to the boil, letting them cook for 4 minutes. Using a colander, drain the potatoes then use paper towels to dry the saucepan, and tip them back in then sprinkle the semolina over. Rattle the potatoes around to coat them well in the semolina. Next (with the lid clamped on) rotate the saucepan roughly – this will give the potatoes a proper bashing so their edges fuzz a little, this adds to the crunch effect once cooked. When the fat is piping hot, tip the semolina-coated potatoes carefully into it (they may sizzle as you put them in) then leave to roast in the oven for an hour or until they are crisp and golden. Turning them over halfway through cooking. If the oven is very hot, they might not need longer than 25 minutes, but it’s better to let them sit in the oven till the very last minute. (Optional: You can pour most of the fat off). Once other foods are plated up, transfer the potatoes into a large (warmed) serving dish and enjoy.